A quarter of a century is a commendable amount of time to run a business, and the Netherlands based lubrication system specialist, Groeneveld, has just reached the milestone of 25 years of operating in the UK. To mark the occasion, it held a series of open days at its Shepshed site earlier this month and Chris Peat was there to get the lowdown. Not only is the UK arm of Groeneveld celebrating a milestone year, the company as a whole will be marking its 45th year of business in 2016. Even though the UK branch was incorporated in 1990, Groeneveld’s products had already reached these shores before then. They came into the country a few years previously, sold by a distributor not far from where the company is now based. Groeneveld’s UK arm was originally based in Loughborough. 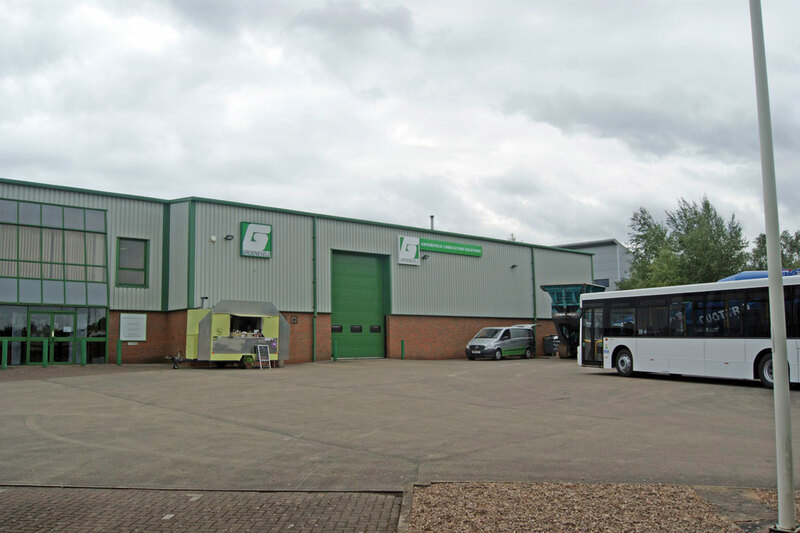 However, the business moved to its current location, Shepshed, in 1996, making its new home in a purpose built facility complete with offices and a warehouse. This latter site was the location for the recent open days. It saw visitors attend from Groeneveld’s customers and the companies it works with, including vehicle dealers and manufacturers. During my visit the MD from an operator of one of the Midland’s most extensive bus networks was being shown around the site. Groeneveld’s UK base of operations in Shepshed. 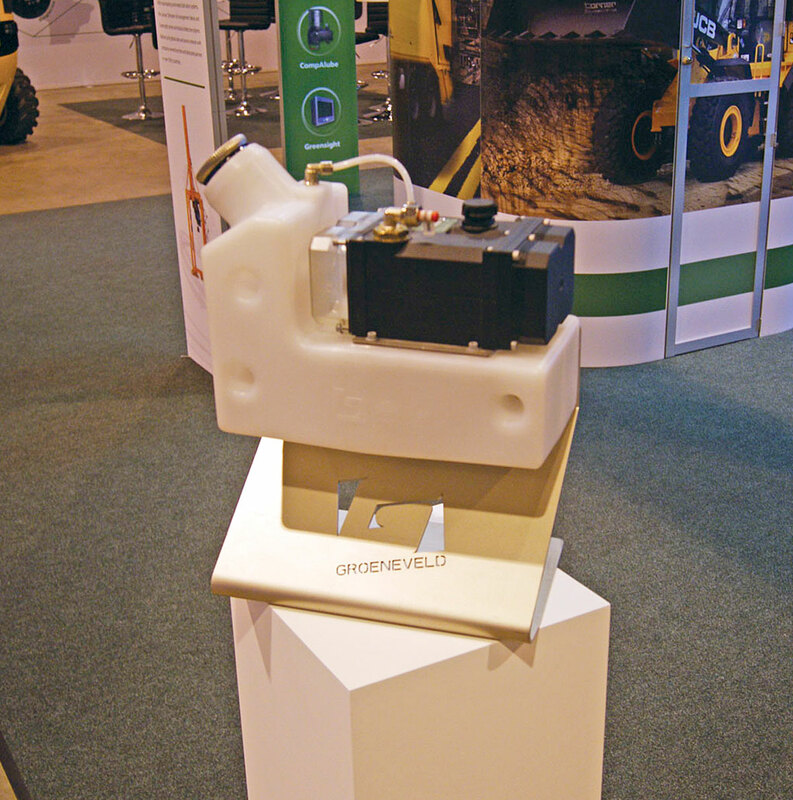 Examples of Groeneveld equipment were displayed at the open day, with numerous vehicles on show with its products fitted. Terex mobile crushing and grading machinery for roadworks, an excavator and a cement mixer were among the exhibits. There was a bus too, a Volvo B8RLE with MCV bodywork, a demonstrator on loan from Volvo Bus. 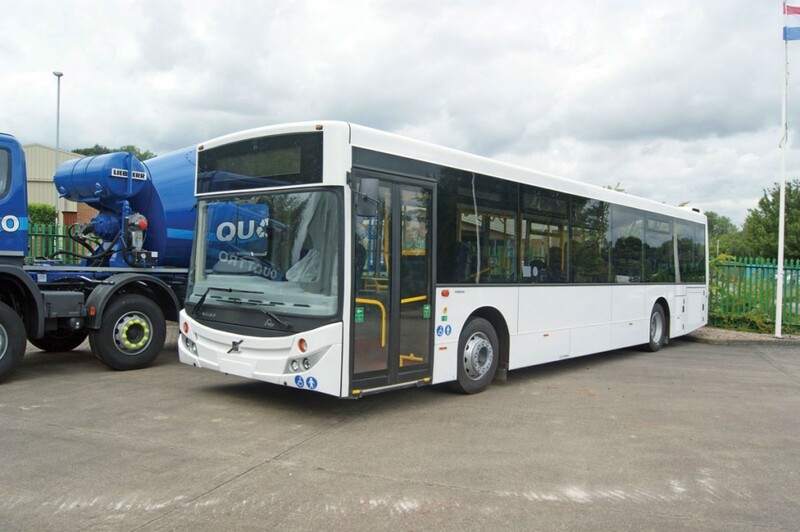 As is standard on all Volvo Euro6 chassis buses, the vehicle featured Groeneveld’s Oilmaster system. 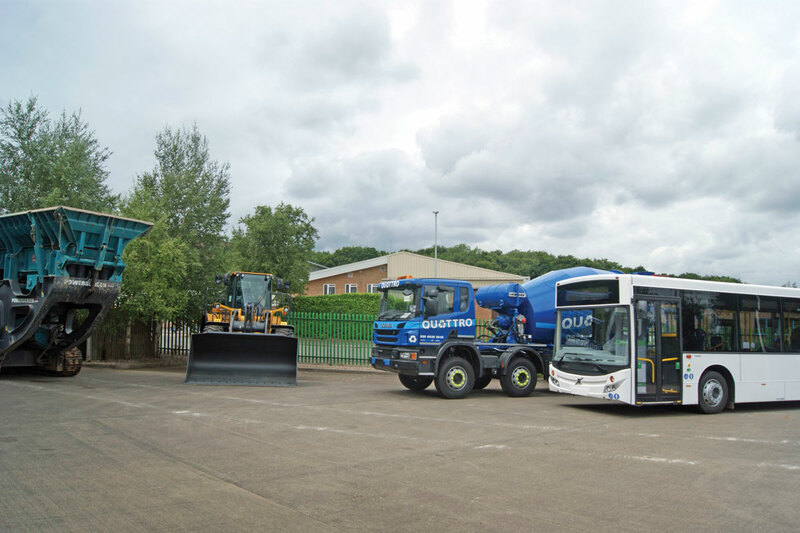 A Volvo B8RLE with MCV bodywork displayed at the open day, featuring Groeneveld’s Oilmaster system. Oilmaster on display in the ‘experience centre’. A Groeneveld ‘experience centre’ was set up in the company’s building, featuring more vehicles with its products as well as a Formula One racing simulation. A mobile food servery and a bar provided refreshments for the three days. Not only was the event a celebration of the milestone anniversary, Groeneveld’s UK MD, Gary Hewitt, said it also provided an opportunity for the company to demonstrate the diversity of the industry sectors it can operate in. Many of its customers are familiar with the systems it provides for their respective industries, whether it be off-road, truck, bus and coach and Ports. However, inviting clients over to its headquarters gave it a chance to show them the entire range it provides, demonstrating its ability to create maintenance solutions for any kind of lubrication requirement. UK Sales Manager, Richard Hamper, joined us. He told us about one large London bus operator that uses Groeneveld’s Oilmaster automatic oil management system on its fleet. Under TfL requirements, it has to run 96% of its services on time, which means it has to run a highly efficient operation, including keeping 10% additional fleet to cover vehicle downtimes and avoid incurring penalties. 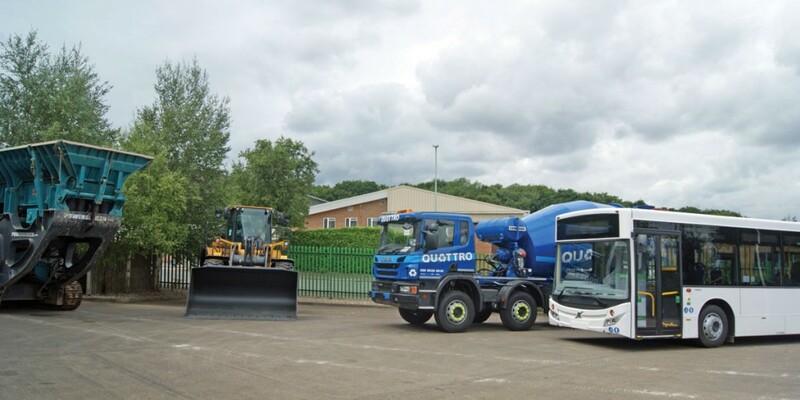 Richard said it is not just these larger, busy fleets in the capital where Oilmaster proves useful in reducing downtime (and therefore financial loss), stressing it can be beneficial for smaller operations elsewhere. (LtoR) Richard Hamper and Gary Hewitt. 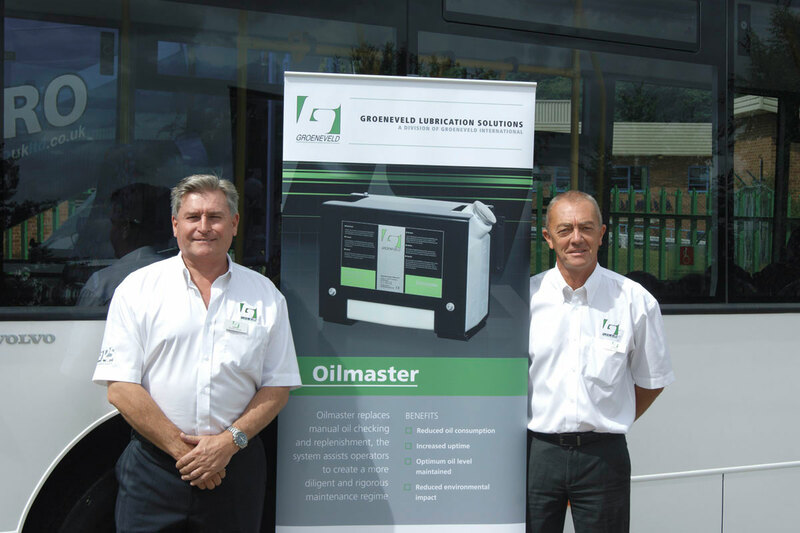 Oilmaster is Groeneveld’s most popular product in the bus and coach industry. It is designed to replace the manual checking and replenishment of oil between changes. It is intended to ensure problem free oil management, reduced maintenance costs, decreased oil consumption, less downtime, consistent lubricant quality and lower environmental impact. Oilmaster monitors the oil level when the ignition is switched on or off and automatically adds more when necessary. ‘Smart electronics’ are used to prevent overfilling of oil. If extra lubricant is required, the system pumps a measured 0.5 litre of oil from its integrated reservoir to the engine sump. This is intended to ensure the engine can always run at the optimum oil level. In general, this level is substantially lower than the maximum level mark on the dipstick, according to the company. This accounts for a large part of the efficiencies the product generates, with oil consumption substantially lower at optimum oil levels. It should also mean less lubricant is needed when changing oil. Information is stored in its electronic memory to enable reliable access to activity and create a more rigorous and diligent maintenance within a customer’s operation. It is not only in the depot where Oilmaster can help. Groeneveld’s marketing material also brings to the fore that it could be convenient for drivers. Anything that avoids having to add oil while out on the road can only be a boon for any operator ensuring the correct quality and type of oil is used at all times. Another benefit is a reduction in repairs, downtime and claims for damages due to engine failure. When fitted, Gary said a vehicle’s oil system can be left for up to six months without having to carry out any manual intervention. Obviously, this depends on the work the vehicle does and its age. According to Gary, it is Oilmaster’s ability to take away the hassle of topping up oil that has attracted the ‘big five’ operators. These customers have found these savings are not just being had on a vehicle basis, but on a depot level too. According to Gary, they have experienced significantly less need to bunker as much oil since Oilmaster’s introduction. It is not just the product attracting customers, as Gary explained it is not a case of selling the kit and leaving the customer to it. The company will sign off every installation of its equipment, ensuring each one is correctly fitted. When a customer orders new vehicles, technicians from the company will follow it into the depot to ensure maintenance staff know it is fitted and what it does. Having already installed Oilmaster on a lot of buses, an area it is particularly aiming to attract more of is coach. Gary was surprised there had not been a greater level of coach interest previously, as he believed the coach market would be the one to take off first, taking into account the distances they travel and the extended amounts of time they spend out of the depot away from maintenance staff. Over the past 25 years, the amount of vehicle types Groeneveld equipment is fitted on in the UK has grown significantly. Richard said that as recently as five years ago the company was not that well known in the bus and coach sector. In that time this market has grown to account for a third of its turnover. Originally, truck and trailer was its main market, followed by off-road vehicles. When one of these was down, Richard said it was not really a case that one would compensate for the other. However, with the bus and coach sector making up a significant chunk of its profits now, any shortfall in the previous two sectors can often be counteracted. Growth in sales to PCV companies was described as ‘phenomenal’ by Richard. Since it first targeted this area around five years ago sales have grown 20% to 25% per year. He believes that by 2017, it will become a mature market for the company. One development is to Oilmaster, which is about to have its third incarnation released. It will have full CANBUS and USB connectivity, which Richard explained means it can be easily integrated into a telematics system. It will be possible for the data it collects to be downloaded via Wi-Fi and viewed as part of a package of information on the condition and performance of the entire vehicle. This is expected to be released as a product at the beginning of 2016. A line up of vehicles at the open day, all fitted with Groeneveld’s lubricant management systems. The new Oilmaster, like the rest of Groeneveld’s products, is to be built in its Italian factory, located just north of Milan. All of its devices are offered with a two year full parts and labour warranty. A team of six engineers are employed directly by the company for maintenance and installation of its products, with a further 18 sub-contracted to ensure good coverage of the country. The UK arm’s parent company is based in the Netherlands. Each of the group’s daughter firms are fully owned by it, yet Richard said there is a lot of autonomy from the Netherlands office. The only thing it demands from the company is it runs on a profitable status and puts a budget into the Netherlands HQ each year for approval. Marketing is left down to the UK branch, which this year includes presenting at Coach and Bus Live. It is planned for the Oilmaster system to be displayed on two buses during the trade show. Groeneveld would appear to hold a leading position in the field of automatic oil management systems, so the fact it has reached the milestone of 25 years doing business in the UK comes as no surprise. As the celebratory event showed, it will continue to build on what has been achieved by constantly developing new products and advances in its existing range to maintain that presence and position.